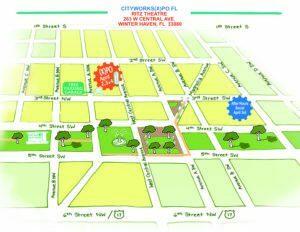 CityWorks(X)po Florida Begins April 3! | Winter Haven Economic Development Council, Inc.
Join us for great ideas at this year’s CityWorks(X)po Florida! You’ll hear incredible speakers sharing thought-provoking presentations during the day, and enjoy special networking opportunities and entertaining events in the evening. If you haven’t registered yet, go to www.cityworksxpofl.com and click the registration link. You’ll join with attendees from communities of all sizes who will meet in Winter Haven for this place-making summit, idea exchange, and festival-style conference. With generous enthusiasm and support from CityWorks(X)po founder, Main Street Winter Haven, Inc., is again partnering with the Greater Winter Haven Chamber of Commerce, City of Winter Haven, Winter Haven Economic Development Council, and Visit Central Florida to bring you CityWorks(X)po Florida. Topics from this year’s innovative speakers include architectural tourism, art education, GIS technology, leadership, sustainability, tiny homes, trails, urban planning, and many more. There will be something for everyone! 5:30-7:30 pm Join us for our After Hours Parking Lot Party – Bike Shop of Winter Haven & N+1 Coffee, 249 3rd Street SW. Networking, Grove Roots beer, music, great food & two signature cocktails all included with your CityWorks(X)po pass. 12:00 pm Lunch – A special (X)po guest, Rick Baker will be joining us for a lunchtime breakout session. Join Rick for lunch and conversation at Fire Restaurant. 4:00 pm Anita Strang, Main Street Winter Haven, Inc. The presentations may be over but the opportunities to connect keep going. Join us for our After Hours Social with great food and drink, followed by a CityWorks(X)po Florida wrap up concert featuring (X)po favorite Walter Parks and Vivian Sessoms. This year’s hosts are Katie Worthington Decker, Greater Winter Haven Chamber of Commerce; Bruce Lyon, Winter Haven Economic Development Council; Donna Sheehan, City of Winter Haven; and Anita Strang, Main Street Winter Haven, Inc. The diverse group of speakers and events is made possible thanks to the Partners mentioned above, as well as other (X)ponential, Placemaking, Connector, and Big Idea Partners. To see the complete Partner list, speaker bios, and schedule details, go to www.cityworksxpofl.com. CityWorks(X)po Florida: Sharing Ideas for Better Places.We hope you’ll join us to connect and learn about ideas to make our communities even better.